Iconic Australian Houses: an exhibition by Karen McCartney and presented in partnership with Architecture Foundation Australia is a behind-the-scenes exploration of 30 of the most architecturally important Australian homes of the past 60 years. The exhibition has been curated by architecture and design editor and author Karen McCartney, and begins in the 1950s with the works of a new breed of Australian architects, and culminating in key works from some of Australia’s contemporary masters. Using material drawn from Karen McCartney's best-selling books 50/60/70 Iconic Australian Houses and 70/80/90 Iconic Australian Houses; the houses featured are brought to life through vivid photography, rich illustrations, 3D models and filmed interviews with the architects who designed the homes and the people who commissioned and live in them. Sydney Living Museums in partnership with Architecture Foundation Australia is delighted to present this important exhibition that looks beyond the physical structures to shine a light on the stories of the architects and clients. The result is an intimate portrait of the design, building and lived experience of that most elusive of creations – the iconic house. 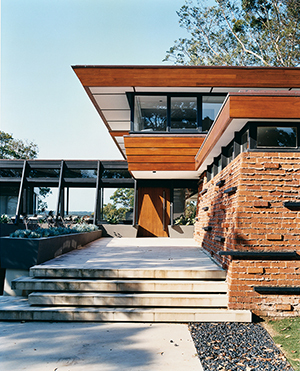 Iconic Australian Houses is a travelling exhibition from Sydney Living Museums. The exhibition is supported by exhibition partner Architecture Foundation Australia, principal partner Stormtech and sponsors the NSW Architecture Registration Board and the University of Newcastle. This project has been assisted by the Australian Government's Visions of Australia program.